wanderlust ATLANTA: INTERVIEW: Topher Payne, "The Santaland Diaries"
INTERVIEW: Topher Payne, "The Santaland Diaries"
"I'm a Crumpet convert!" announced my friend Sara during the standing ovation immediately following her seeing The Santaland Diaries for the first time. I'd seen the show a couple of times in its previous 18 years, but now in its 19th year at Horizon Theatre, there are a couple of things that make it brand new! One of those new things is that famous Atlanta playwright, screenwriter, and actor Topher Payne is playing Crumpet, one of Santa's helper elves at Macy's in New York City. Topher granted me a brief interview! While we Atlantans know Topher Payne as a playwright, a screenwriter, and an actor. He calls himself a storyteller, and he's exactly that. That's also what makes his so perfect for The Santaland Diaries! The other major change to this year's performance is that the author of the play requested that all of the characters' lines come from the Crumpet character. It's quite a feat on Topher's end—to voice 44 different characters in 90 minutes—and it's a triumph in acting for the sidekicks—the absolutely lovely and brilliant Lala Cochran and the talented and hilarious Enoch King. 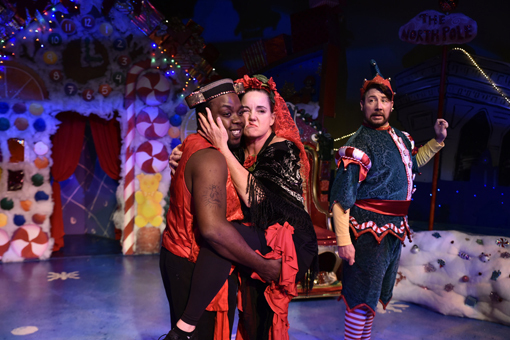 wanderlust ATLANTA: Why should locals and tourists come see The Santaland Diaries at Horizon Theatre? Topher: This time of year we all start feeling harried, yet we're still trying to capture the feelings this joyous time of year should bring us. For those seeking a cathartic moment—90 minutes, at least—for those looking for some fun, for those looking for a good storytelling...that's what The Santaland Diaries offers. And it's short, it's easy to schedule, and you don't have to make the time to wrap it! wanderlust ATLANTA: What are you personally bringing to the role of Crumpet? Topher: I was apprehensive about coming into the process with anyone thinking that I was going to replicate what they'd seen for the last 18 years. I admire Harold Leaver's performance as Crumpet, but we're different people. I didn't want to set the stage for disappointing comparison. Working with director Jeff Adler, we're going back and treating it like a new story...it feels like and looks like The Santaland Diaries, but it has a new storyteller. 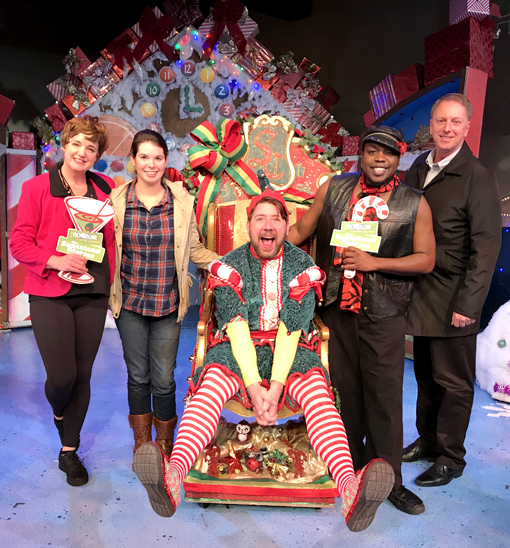 My friend Sara, pictured above with the cast of The Santaland Diaries, loved the show, which we enjoyed from the front row, but this show is fantastic from any seat in the intimate Horizon Theatre. We've already planned to come back and see it again next year! Topher shared with me that minutes before he takes the stage he's excited and terrified at the same time. The responsibility for telling a story non-stop for 90 minutes would intimidate most of us, but Topher is brilliant! 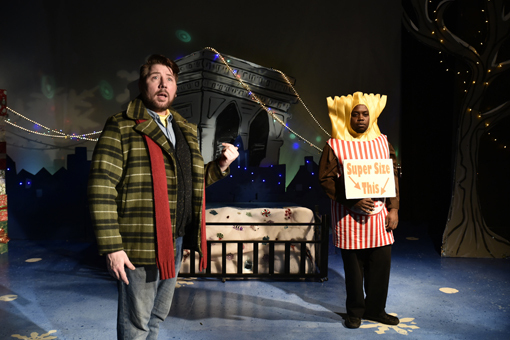 Before we get to the story of Crumpet, David (Topher Payne) shares with us just how he became a Santaland elf, as well as some tangential thoughts about the everyday, that do in fact tie to the story at hand. 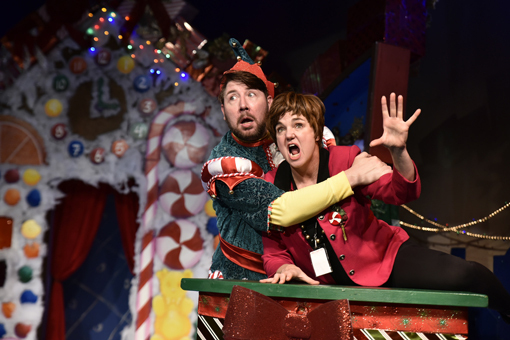 Throughout the play, we learn about the some of the children who visit Santa—primarily the crying ones, the pretentious ones, the spoiled brats—as well as the social media-crazed grownups, fellow elves, a few of the Santas, and visitors from other lands, to name a few. The regaling of elf training is particularly hilarious, not to mention David's onstage "dreams" of being on a soap opera. wanderlust ATLANTA: We know about some of your wonderful professional accomplishments. Will you share with us a little about your early Atlanta life? Topher: I'm originally from Mississippi. When I moved to Atlanta I found myself knocking on theater doors and getting jobs doing whatever was needed that day. Years later, opportunities have kept expanding to become a full-time writer in Atlanta. I still travel to Vancouver and Los Angeles for film work, but with the thriving film industry in Georgia, there are lots more local opportunities. wanderlust ATLANTA: Probably not a totally fair question, given how young you are, but what do you hope is Topher Payne's legacy? Topher: At 36 years old, my current mission is to tell stories not for the critics, not for those making notes while attending a show, but for the ticket-purchasing theatergoer. When it comes time to pass the guard, if Atlanta is indeed a place where a full-time writer can thrive, then I'll know I spent my time well. That's what I hope I'm helping to create. 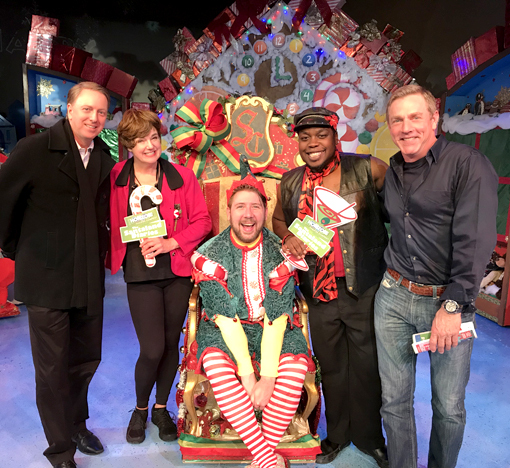 The first time I saw The Santaland Diaries this year (I've seen it two more times this year and am going to see it again this week) was with my friend Barry (pictured above, right). We saw it together when I saw it for the first time years ago. It's tradition! It was awesome to see Topher in the role of Crumpet, but this wasn't his first experience with Horizon Theatre. You see, a number of years ago, approximately a decade, Topher was one of Crumpet's sidekicks...for two years! But lets time-travel to when Topher first moved to Atlanta. 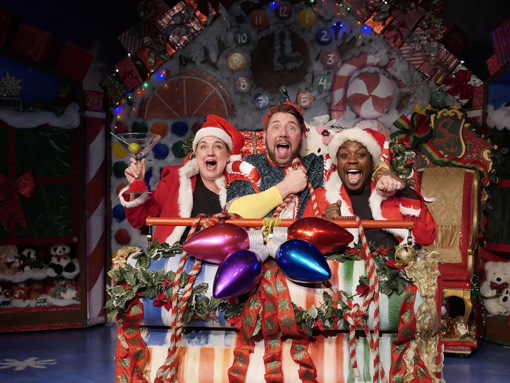 His first job with a professional theatre in Atlanta was helping to build the set of...you guessed it, The Santaland Diaries at Horizon Theatre for its very first run 19 years ago! Behind the scenes, Jeff Adler is the director of The Santaland Diaries. Can you imagine a more fun job?! But that's not all Jeff is doing. He and his wife Lisa are co-founders of Horizon Theatre Company. Jeff has been behind the scenes for every production put on at Horizon. And most recently Jeff has been a theatre professor at The New School in Atlanta. His drama students recently performed "Hamlet" with the governor of Georgia in the audience. wanderlust ATLANTA: How did you learn all the lines for a 90-minute play? Topher: I'm marveling at myself this time! I started in August reading lines practically 24 hours a day. The key is repetition and appreciation. Do you remember how quickly you learned the words to a favorite song in your high school years? That's how! wanderlust ATLANTA: I sometimes lose my way when telling a story. If that's ever happened to you, how do you recover? Topher: I use physical action and location to get me back on script. Once during an early run of The Santaland Diaries, I took a scripted sip of water a little early. The scripted words that came after the sip then came out of my mouth, skipping the words that were the cue for my fellow actors to come on stage. I had to backtrack to where I would have been to speak the missed words and quickly got back on track. Topher recently shared in an Instagram takeover of Horizon Theatre's channel, "My most challenging voice has become my favorite—my very odd, completely unsuccessful, but fully-committed attempt at singing like Billie Holiday." It's truly quite...remarkable. I've been a Lala Cochran fan since the first time I saw her perform. She's one of those actors that I'll go see a show just because she's in it. This Suzi Bass Award-winning actress always surrounds herself by other incredible talent, so whatever the show is, you know it's going to be fantastic! Enoch King is absolutely brilliant and hilarious in The Santaland Diaries. He makes the audience laugh so hard and so long! I'm laughing as I type! What's been called his breakout role was also at Horizon Theatre, the acclaimed Constellations, which was Horizon's 2017 season opener. He's since performed in other dramatic roles and next he will be performing in A Raisin in the Sun in St. Petersburg, Florida—where I was born—at American Theatre. Don't miss this show! And don't bring the kids. This is an adult show. To note Topher's range of talent, he's written numerous movies for the Hallmark Channel, the most recent being the holiday show titled A Gift To Remember, definitely on my "to watch" list! 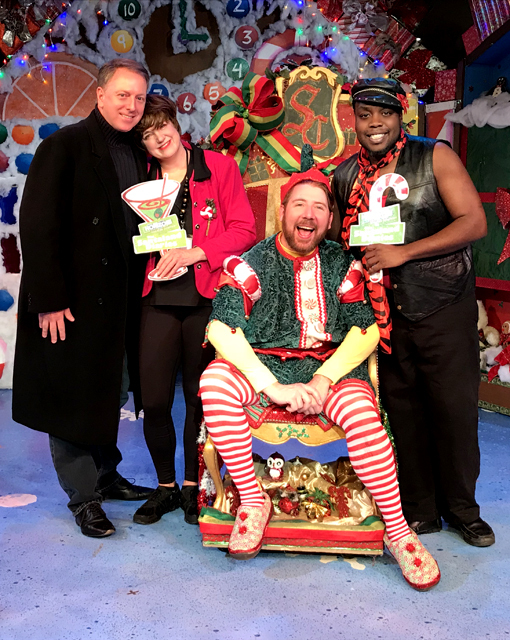 Come see Topher, Lala, and Enoch in The Santaland Diaries at Horizon Theatre through Sunday, December 31, but don't wait to get your tickets...some shows are already sold out! And be sure to say "Hello" and get a snapshot with the stars immediately following the show! Disclaimer: A few months ago I was voted to Horizon Theatre's Board of Directors, a position I'm honored to hold, particularly with such esteemed board members. That role in no way influences my writings about Horizon Theatre or its shows. I've been a fan and supporter of Horizon Theatre for many years, as well as the arts and performing arts in Atlanta overall.